Make your own soakers just like Grandma used to make! Practical, economical and a pleasant alternative to plastic covers. Wool soakers draw moisture away . . . help prevent diaper rashes . . . remain dry outside. Cut equal-sided triangles from old, shrunk and matted 100% wool sweaters, and zigzag-stitch edges to prevent unraveling (optional). You can usually get two small baby bum sweaters from one adult sweater, or one large baby bum sweater. Check out your local Goodwill, second-hand stores or other thrift stores for second-hand wool sweaters to use - very cheap! Cut along cutting lines for one baby bum sweater. 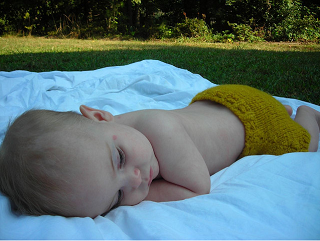 Set aside the wrist-bands for use as leg bands on your baby bum sweater. Picture one: (left) Cut along cutting lines (dashes in picture) for one "baby bum sweater" . Set aside the wrist-bands for use as leg bands on your baby bum sweater. Picture two: (right) This is what your pattern should look like - using the sweater's waist band as the baby bum sweater waist band. Picture three: (left) Fold up the material towards the waist band. Bring waist-band sides together at front. Picture four: (right) Sew along lines, about halfway along sides to form leg-holes. Be careful not to sew the leg-holes completely shut. You can adjust the leg hole openings, larger or smaller, to fit your baby's legs. Picture five: (left) Your bum sweater should look something like this. Now take the wrist-bands you set aside earlier, and sew around the leg openings. Picture six: (right) As an alternative, you can sew it like above, but trim off the tip of the top of the triangle. This will give you a wider waistband, when you attach it to all together. To Finish: Crochet a long string of single crochet twice as long as the waistband. Thread through the baby bum sweater waistband about every inch - poking the crochet string in and out - and tie in front. -- includes complete instructions to knit, crochet or stitch your own hand-made soakers! Plus lots of options, ideas and easy diapering hints . . .
Photo credit: Thanks to Angela for drawing the pictures!